Choosing wine can be overwhelming. Choosing the best value wine you can every time is even harder. I know what it is like to be in a bottle shop and feel overwhelmed. Or looking at a wine list in a restaurant and wondering ‘Which of these am I going to like, which is going to be the best bang for my buck, and least likely to be disappointing?’ Often choosing a wine at a restaurant is the first decision you have to make! A bottle shop can be even more confusing. Your average Dan Murphy's store holds thousands of items. Meanwhile, most likely you have a mission – choosing the best value wine you can. Whether it is buying a single bottle of cold white wine or half a dozen nice reds at the bottle shop, or a bottle of red to share at a restaurant table. Where do you go? What do you choose? If you’re like me, most likely you have ‘go-to’- wines that you know are what you like and are good value. But what of all the other wines out there? – surely for every 1 of your go-to wines there are dozens of others in the same style and price-point that are just as good or better. The trick is to find them and, perhaps more importantly, exclude the ones more likely to be duds! There are only a limited number of opportunities to enjoy a nice glass of wine, with our busy lives, the expense involved, and all of the other considerations. When I have an opportunity to enjoy a glass of wine, I want to make the most of it. So the question is, how do you find the gems in a wine list or at the bottle shop, without breaking the bank, without regretting your choice, and without ending up with a wine cellar full of mediocre wines? Now this may sound obvious, – of course, good wines come from good vineyards in great wine growing regions! In truth, you’d be surprised how often it is overlooked, and how much you can improve your chances of picking the best wines by applying this principle. Why does a wine’s growing region matter so much? It all comes down to the quality of the grapes going into the wine – in short, only great grapes can make great wine, and great grapes can only come from growing conditions that match their unique varietal characteristics. Some grape varieties, like Pinot Noir, only produce outstanding wine in a specific type of climate – usually cooler climates with low humidity in summer, like southern Victoria and Tasmania. In fact, Pinot Noir is known as the ‘Diva’ of wine grapes because it is notoriously hard to grow to a standard that will make excellent wine. The most reliable way to choose a wine made in great growing conditions is to identify a region that has an outstanding reputation and climate suited to the wine’s variety or style. For example, when looking for a full-bodied Shiraz, great regions like the Barossa Valley consistently have that magic combination of climate, soil and geography that bring out the best in a full-bodied, rich style of Shiraz. Now, if you walk into the bottle shop in Australia, chances are you will be faced with dozens, if not hundreds of Australian Shirazes from all over the country. Most of those won’t be from the great growing regions of the country, and most won’t be advertising the fact either (imagine if they did – “This wine is not from from the Barossa Valley”). In fact, many wine companies will cover up their lower pedigree of location by being vague on the label (e.g. South-Eastern Australia). For the most part, you can disregard any wine that is not proudly displaying a specific location on the front label. So, already, you have narrowed your field and removed most of the choices that are most likely to disappoint. Now, it is just a matter of choosing one of those specific locations with the aim of picking a good match for the variety and style you are focussed on (in this case the variety is Shiraz and the style is big, bold, full bodied red wine). For example, for a full-bodied Shiraz, some of your best options, listed in the guide are going to be Barossa Valley or McLaren Vale in South Australia, or the Grampians region in Victoria. Once you have narrowed down your choice to a great region for a given variety and style of wine, your chances of getting a great wine experience, with the best value for money are hugely improved. These regions all have conditions – that is, weather, soil and topography, that are well suited to these varieties. In addition, they have a local culture of excellence in those specific varieties, – local competition, cross-fertilisation of ideas and techniques, and just straight-out inspiration from their peers. The geographic and cultural factors combine to make for better wine. 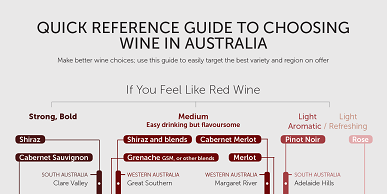 The wine buying guide you can download below does the work for you in matching region to variety and style – all you need to do is decide what style or variety of wine you are after, and it gives you the best regions to choose from. 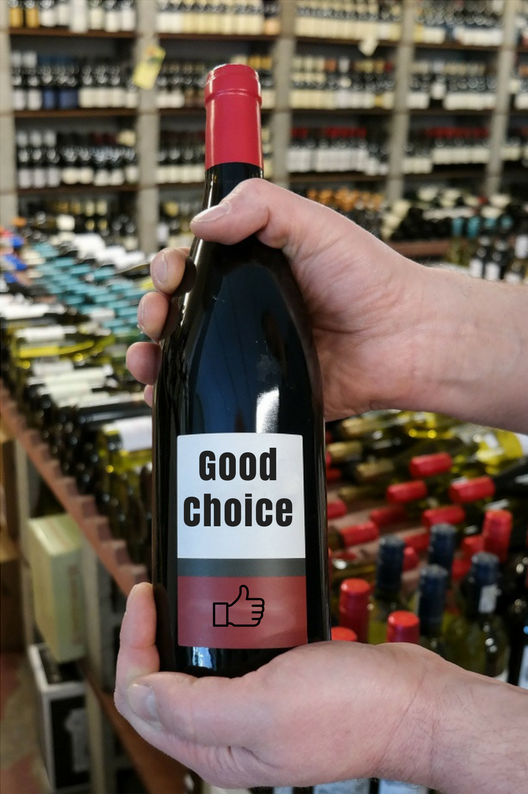 If you are choosing wine in a bottle shop, you may be presented with two or three wines of the sames style or variety, from the same region and the same vintage, and at similar prices. What to do? When in doubt, pick the winery with the best reputation at the higher end of the market. Wineries that have made their reputations on exemplary $50 and $80 wines will most likely produce better value $20 wines. They will have better quality vineyard management, better attention to detail in the winery, they will have invested more in their staff, equipment, quality control, blending etc etc. One trick to look out for here is to pick the ‘estate grown’ wines if you can. Some producers will have a cheaper wines grown at an external vineyard over which they have less control – and great wines are made in the vineyard. Their estate grown wines will likely be better value at $20 (if you can get them at $20 – often they are the more expensive models). Sometimes it is difficult to tell if it is estate grown, but it is worth scanning the back label to check. If you don’t know which wines have the better reputation for higher-end wines, ask the bottle shop staff. In a restaurant you may not be able to judge this so easily, so basing your decision on matching region and wine style or variety is the easiest approach for a quick decision. Using those two principles will give you a head start every time when choosing great value wine. All the best in your wine adventures!